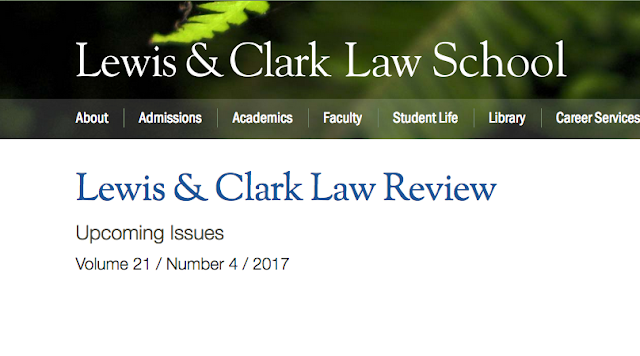 I am happy to report the publication of my article, "The Corporate Social Responsibilities of Financial Institutions for the Conduct of their Borrowers: The View From International Law and Standards," Lewis & CLark Law Review 21(4):881-920 (2018). The object was to think broadly about the regulatory and governance frameworks that are emerging around increasingly well recognized responsibilities of intermediaries for the conduct of their clients. The particular focus is on financial institutions. These institutions are increasingly understood as suitable substitutes for the state in the creation and administration of regulatory systems (the issue of governmentalization). At the same time, this development also opens the possibility for states to assert a regulatory authority even when acting in private form (the privatization of public authority). This willingness of states and other public organs to delegate is especially potent with respect to rules states are unwilling or incapable of adopting through traditional assertions of public authority. Yet the examination also reveals parallels between the extension of corporate responsibility within supply chains and the extension of CSR responsibility to the client relationships of financial institutions. The abstract, table of contents and Introduction follow. As always comments and reactions most welcome for what is a long term work in progress. The per-publication version of the article may be accessed HERE. Corporate social responsibility (CSR) can be split along two distinct lines. The first touches on the nature of corporate personality and is rooted in domestic law regulating enterprises specifically and legal persons generally. The second touches on the nature of the rights of individuals and is rooted in international law (and sometimes domestic constitutional law) defining the scope of the human rights of individuals and the consequential obligations of states and legal persons. Both conversations intertwine, though they tend to operate autonomously. In both cases, however, the traditional focus of corporate responsibility has focused on the relationship between an operating company and its direct effects on individuals, society, and the environment. But increasing attention has been paid to indirect compliance through private intermediaries—the financial institutions that provide operating capital to enterprises. This Article considers the corporate social responsibilities of financial institutions, including sovereign wealth funds, for the conduct of their borrowers. The focus will be the extent of any duty or responsibility of lenders to ensure that their borrowers comply with CSR obligations (or alternatively conform to international human rights standards) as a core aspect of their own CSR obligations, or alternatively, of their responsibility to respect human rights. Section II examines the general regulatory framework. There are two relevant aspects. The first is to understand the scope and character of the legal norms that may apply to enterprises generally with respect to their operations that might be understood as CSR or human rights related in nature. The second aspect considers the range of non-legal normative governance rules that might apply. In the process, it will be important to distinguish between a CSR based regulatory approach and a human rights based approach. Section III considers the application of these norms to financial institutions. This requites distinguishing between those obligations that apply to the internal operations of financial institutions generally, and those obligations that apply to the financial institution’s obligations with respect to its lending activities, that is with respect to its relationship with its borrowers. The Article includes a brief examination of recent cases in which financial institutions undertook such a responsibility, and the ways in which the particular institution undertook the obligation. Three different types of institutions are considered—private banks, sovereign wealth funds/state owned enterprises, and international financial institutions (IFIs). The Article ends with a preliminary consideration of the consequences of this movement for domestic CSR in the United States. occupies great importance to the debates about the nature of corporate personality, and the governance responsibilities of enterprises is as old as the corporation itself.6 At its broadest, CSR refers to the extent to which an aggregation of capital recognized as a separate legal person must, may, or should, operate in accordance with certain standards of conduct. It mimics the general conversation a society has about the legal, civic, ethical, and societal obligations of its citizens. But since the 1930s, at least, CSR acquired a quite specific and distinct meaning. It asks the question: What is the extent of the legal, social, civic, and moral obligations of enterprises in their operations?7 A spectrum of views advanced reflects quite distinct views of the nature of the corporate enterprise and its relation to the polity in which it is constituted and licensed to operate. Both domestic CSR and international human rights conversations intertwine, though they tend to operate autonomously. In both cases, however, the traditional focus of corporate responsibility is on the relationship between an operating company and its direct effects on individuals, society, and the environment. That discussion—contentious, conflicted, and unresolved—centers its analysis on the parameters of direct compliance. These touch on the use of the domestic law of home and host states, on soft law and indigenous governance structures, and on the private law of enterprises directly on the enterprise that is the object of behavior regulation. Yet in its conventional form, the CSR debates traditionally marginalized indirect compliance; for example, there was the instrumental use of other actors to compel CSR compliance by operating companies. One critical actor has recently drawn attention in this respect—the financial institutions that provide operating capital to enterprises. To what extent are financial institutions responsible for the human rights breaches of their borrowers? “While the obligation for the protection of human rights lies with the state, [International Financial Institutions (IFIs)] and their member states also have responsibilities to ensure that activities they support do not cause, or contribute to, human rights abuses by putting in place adequate safeguards.”39 This adds a new and important dimension to CSR and human rights governance matters. But it also produces substantial consequences which are both functional and normative. The functional consequences turn on the way that such indirect compliance may affect loan making—especially with respect to pricing loans, assessing risk, and developing covenants and the mechanisms to monitor compliance. The normative consequences might be profound—to impose on lenders a CSR-human rights responsibility to monitor and discipline their borrowers would suggest both a privatization of state regulatory power (the lender would effectively legislate CSR downstream through its contracts) and an extension of CSR principle to the financial sector in ways that affect financial markets and the cost of capital in unexplored ways. A secondary responsibility of financial sector enterprises suggests the intertwining of CSR and human rights at the heart of loan making, pricing, the regulatory effect of covenants, and the management of borrowers through a requirement for due diligence during the life of the relationship. This Article considers the corporate social responsibilities of financial institutions, including sovereign wealth funds (SWFs), for the conduct of their borrowers. The focus will be the extent of any duty or responsibility of lenders to ensure that their borrowers comply with CSR obligations (or alternatively conform to international human rights standards) as a core aspect of their own CSR obligations, or alternatively, of their responsibility to respect human rights. After this introduction, Section II examines the general regulatory framework. There are two aspects that are relevant. The first is to understand the scope and character of the legal norms that may be applied to enterprises generally with respect to their operations that might be understood as CSR-human rights related in nature. The second is to consider the range of non-legal normative governance rules that might apply. In the process, it will be important to distinguish between a CSR based regulatory approach and a human rights based approach. Section III considers the application of these norms to financial institutions. This requires distinguishing between those obligations that apply to the internal operations of financial institutions generally, and those obligations that apply to the financial institution’s obligations with respect to its lending activities, that is, with respect to its relationship with its borrowers. The Article includes a brief examination of recent cases in which financial institutions undertook such a responsibility and the ways in which that obligation was undertaken. Three different types of institutions are considered: private banks, SWFs, and IFIs. The Article ends with a preliminary consideration of the consequences of this movement for domestic CSR in the United States. 1 Writings about CSR have grown enormously over the last two decades. For a sampling, see Andreas Georg Scherer & Guido Palazzo, Globalization and Corporate Social Responsibility, in THE OXFORD HANDBOOK OF CORPORATE SOCIAL RESPONSIBILITY 413 (A. Crane et al. eds., 2008); Miriam A. Cherry & Judd F. Sneirson, Beyond Profit: Rethinking Corporate Social Responsibility and Greenwashing After the BP Oil Disaster, 85 TUL. L. REV. 983 (2011); C.A. Harwell Wells, The Cycles of Corporate Social Responsibility: An Historical Retrospective for the Twenty-first Century, 51 U. KAN. L. REV. 77 (2002); Geoffrey Heal, Corporate Social Responsibility: An Economic and Financial Framework, 30 GENEVA PAPERS ON RISK & INS. 387 (2005); Catherine J. Morrison Paul & Donald S. Siegel, Corporate Social Responsibility and Economic Performance (Jan. 2006), https://ssrn.com/abstract=900838. 2 See, e.g., JANET DINE, THE GOVERNANCE OF CORPORATE GROUPS, at xix (2004) (analyzing “the power and regulatory immunity of global corporations,” and suggesting legal tools to strengthen consumer resistance to damaging products); M Galanter, Law’s Elusive Promise: Learning from Bhopal, in TRANSNATIONAL LEGAL PROCESSES 172, 173–74 (Michael Likosky ed., 2002) (discussing the legal phase of the Bhopal disaster); PETER T. MUCHLINSKI, MULTINATIONAL ENTERPRISES AND THE LAW, at ix (2d ed. 2007) (giving a “comprehensive introduction to the regulation of multinational enterprises . . . as the principal vehicles for foreign direct investment”); Marleen A. O’Connor, Restructuring the Corporation’s Nexus of Contracts: Recognizing a Fiduciary Duty to Protect Displaced Workers, 69 N.C. L. REV. 1189, 1194–96 (1991) (concluding “the corporation’s nexus of contracts should be restructured to recognize that directors have fiduciary duties to mitigate the effects of layoffs and plant closings upon displaced workers”); Robert B. Thompson, Piercing the Veil Within Corporate Groups: Corporate Shareholders as Mere Investors, 13 CONN. J. INT’L L. 379, 379– 380 (1999) (examining why courts pierce the corporate veil more frequently in cases involving tort claims as opposed to other contexts); Nicole Rosenkrantz, Note, The Parent Trap: Using the Good Samaritan Doctrine to Hold Parent Corporations Directly Liable for Their Negligence, 37 B.C. L. REV. 1061, 1086–87 (1996) (examining the viability of the “Good Samaritan Doctrine” to hold corporations liable for their negligent acts). 3 See ECOSOC, Sub-Comm’n on the Promotion & Prot. of Human Rights, Norms on the Responsibilities of Transnational Corporations and Other Business Enterprises with Regard to Human Rights, ¶ 1 U.N. Doc. E/CN.4/Sub.2/ 2003/12/Rev.2 (Aug. 26, 2003), https://documents-dds-ny.un.org/doc/UNDOC/GEN/ G03/160/08/PDF/G0316008.pdf?OpenElement; see also SURYA DEVA, REGULATING CORPORATE HUMAN RIGHTS VIOLATIONS: HUMANIZING BUSINESS 1 (2012); David Kinley & Junko Tadaki, From Talk to Walk: The Emergence of Human Rights Responsibilities for Corporations at International Law, 44 VA. J. INT’L L. 931, 933–35 (2004). “It is impossible to incorporate respect for the values on which our existence is based into the current practices that aim to maximize profit regardless of other considerations.” ECOSOC, Sub-Comm’n on Prevention of Discrimination & Prot. of Minorities, Working Document: The Realization of Economic, Social and Cultural Rights: The Question of Transnational Corporations, ¶ 21, U.N. DOC. E/CN.4/SUB.2/1998/6 (June 10, 1998) (prepared by Mr. El Hadji Guissé). 4 See, e.g., Adrian Cadbury, Corporate Social Responsibility, 1(1) TWENTY-FIRST CENTURY SOCIETY 5–21(2006). 5 See Larry Catá Backer, Corporate Social Responsibility Law—A Tentative Syllabus, LAW AT THE END OF THE DAY (Apr. 11, 2017), http://lcbackerblog.blogspot.com/ 2017/04/corporate-social-responsibility-law.html. 6 For an example, see contributions to Symposium, Corporate Social Responsibility: Paradigm or Paradox?, 84 CORNELL L. REV. 1282, 1290 (1999). 7 The germinal debate, the contours of which have remained largely unchanged in relationship to domestic law, started in the 1930s between Adolf A. Berle and E. Merrick Dodd. See generally A. A. Berle, Jr., For Whom Corporate Managers Are Trustees: A Note, 45 HARV. L. REV. 1365 (1932); E. Merrick Dodd, Jr., For Whom Are Corporate Managers Trustees?, 45 HARV. L. REV. 1145 (1932). 8 Larry Catá Backer, The Autonomous Global Corporation: On the Role of Organizational Law beyond Asset Partitioning and Legal Personality, 41 TULSA L. REV. 541, 541–42 (2006). 9 See, e.g., Dodge v. Ford Motor Co., 170 N.W. 668, 681–82 (Mich. 1919). 10 Katsuhito Iwai, Persons, Things and Corporations: The Corporate Personality Controversy and Comparative Corporate Governance, 47 AM. J. COMP. L. 583, 586 (1999). 11 See, e.g., Milton Friedman, The Social Responsibility of Business Is to Increase Its Profits, N.Y. TIMES MAG., Sept. 13, 1970, at 33. 13 See Iwai, supra note 10, at 585–86. RESPONSIBILITY: CRISIS & CRITIQUE 1–2, 17 (2013). 15 See M. Todd Henderson & Anup Malani, Corporate Philanthropy and the Market for Altruism, 109 COLUM. L. REV. 571, 572–73 (2009) (exploring the demand by corporate stakeholders for charitable activities). The trend beyond charity is discussed in Larry Catá Backer, Multinational Corporations, Transnational Law: The United Nations’ Norms on the Responsibilities of Transnational Corporations as a Harbinger of Corporate Social Responsibility in International Law, 37 COLUM. HUM. RTS. L. REV. 287 (2006). 16 See Michael E. Porter & Mark R. Kramer, Creating Shared Value: How to Reinvent Capitalism—and Unleash a Wave of Innovation and Growth, HARV. BUS. REV., Jan.–Feb. 2011, at 4; see also Shlensky v. Wrigley, 237 N.E.2d 776, 780 (Ill. App. 1968). 17 See, e.g., Henry Hansmann & Reinier Kraakman, The End of History for Corporate Law, 89 GEO. L.J. 439, 468 (2001). 18 Jerome J. Shestack, Corporate Social Responsibility in a Changing Corporate World, in CORPORATE SOCIAL RESPONSIBILITY: THE CORPORATE GOVERNANCE OF THE 21ST CENTURY 113, 116 (Ramon Mullerat ed., 2011). 19 See A. P. Smith Mfg. Co. v. Barlow, 98 A.2d 581, 586, 590 (N.J. 1953) (holding that a corporation may make a charitable contribution where it promotes the goodwill of the corporation). 20 See DAVID VOGEL, THE MARKET FOR VIRTUE: THE POTENTIAL AND LIMITS OF CORPORATE SOCIAL RESPONSIBILITY 16–17 (2005); Matteo Tonello, The Business Case for Corporate Social Responsibility, HARVARD LAW SCH. FORUM ON CORP. GOVERNANCE & FIN. REGULATION (June 26, 2011), https://corpgov.law.harvard.edu/2011/06/26/the- business-case-for-corporate-social-responsibility/. 21 See Erika R. George, Tweeting to Topple Tyranny, Social Media and Corporate Social Responsibility: A Reply to Anupam Chander, 2 CALIF. L. REV. CIR. 23, 38 (2011). 22 See generally Larry Catá Backer, From Moral Obligation to International Law: Disclosure Systems, Markets and the Regulation of Multinational Corporations, 39 GEO. J. INT’L L. 591 (2008) (suggesting “the focus ought to turn away from the cultivation of systems of substantive norms to a more supervisory role in the construction of markets within which stakeholders can more readily assess their involvement”). 23 Dodd-Frank Wall Street Reform and Consumer Protection Act, Pub. L. No. 111-203, § 115(a)(1), 124 Stat. 1376, 1403 (2010) (codified as amended in scattered sections of the U.S. Code). 24 See e.g., Ohio Rev. Code Ann. § 1701.59 (West 2017) (allowing directors the discretion to consider factors such as the interests of employees, state economy, and community considerations in determining what is in the best interests of the corporation). 25 See Richard B. Tyler, Other Constituency Statutes, 59 MO. L. REV. 373, 377 (1994). 26 See, e.g., THEODORE H. MORAN, MULTINATIONAL CORPORATIONS AND THE POLITICS OF DEPENDENCE: COPPER IN CHILE 5–6 (1974). 27 See id. at 252–53. 28 See Marc Galanter, The Transnational Traffic in Legal Remedies, in LEARNING FROM DISASTER: RISK MANAGEMENT AFTER BHOPAL 133, 148 (Sheila Jasanoff ed., 1994). 29 See, e.g., Moran, supra note 26, at 6. 30 See, Anupam Chander, Googling Freedom, 99 CALIF. L. REV. 1, 22–31 (2011) (elaborating a social responsibility of business in an unfree society); cf. George, supra note 21, at 25–26. 31 The most powerful of these arguments focused on the governance gaps that result from the application of the free movement logic of economic globalization in the context of the laws of territorially bounded states whose laws could not freely move. The resulting governance gap was produced where enterprises and production chains operated among states and no one state had the power to fully regulate the global operations of the enterprise. “This makes it extremely difficult for any jurisdiction to regulate the overall activities of multinationals, and it can prevent the victims of corporate-related human rights abuses from obtaining adequate remedy.” JOHN GERARD RUGGIE, JUST BUSINESS: MULTINATIONAL CORPORATIONS AND HUMAN RIGHTS, at xxxiii (2013). “Thus, business and human rights is a microcosm of a larger crisis in contemporary governance: the widening gaps between the scope and impact of economic forces and actors, and the capacity of societies to manage their adverse consequences.” Id. 32 See e.g., Jordan J. Paust, Nonstate Actor Participation in International Law and the Pretense of Exclusion, 51 VA. J. INT’L L. 977, 977–78 (2011). 33 See Penelope Simons, The Governance Gap: Domestic Laws and Other Governance Mechanisms, in THE GOVERNANCE GAP: EXTRACTIVE INDUSTRIES, HUMAN RIGHTS, AND THE HOME STATE ADVANTAGE 178, 178 (2014). 34 See R. Vernon, Codes on Transnationals: Ingredients for an Effective International Regime, in 20 TRANSNATIONAL CORPORATIONS: THE INTERNATIONAL LEGAL FRAMEWORK 69, 70–72 (A.A. Fatouros ed., 1994). “When governments think of an appropriate regime for ‘their’ transnational corporations, most tend to look for principles that will enlarge the rights of those corporations in foreign countries without impairing the responsibilities of such corporations to the home government.” Id. at 72. 35 See Kevin T. Jackson, Global Corporate Governance: Soft Law and Reputational Accountability, 35 BROOK. J. INT’L L. 41, 81 (2010). Business and Human Rights: Implementing the United Nations “Protect, Respect and Remedy” Framework, U.N. Doc. HR/PUB/11/04 (2011), http://www.ohchr.org/Documents/ Publications/GuidingPrinciplesBusinessHR_EN.pdf; see BEATA FARACIK, EUROPEAN PARLIAMENT, STUDY: IMPLEMENTATION OF THE UN GUIDING PRINCIPLES ON BUSINESS AND HUMAN RIGHTS 10 (2017). 38 OECD GUIDELINES FOR MULTINATIONAL ENTERPRISES (2011), http:// www.oecd.org/daf/inv/mne/48004323.pdf. 39 Joint Statement to the UN Human Rights Council, World Bank and Other International Financial Institutions Must Uphold Human Rights in All Activities They Support, GLOBAL INITIATIVE FOR ECONOMIC, SOCIAL AND CULTURAL RIGHTS (Sept. 9, 2013), http://globalinitiative-escr.org/the-world-bank-and-other-international-financial- institutions-must-uphold-human-rights-in-all-activities-they-support/.